We don’t just do plants! Betty’s Azalea Ranch carries a full assortment of bird feeders and seed. 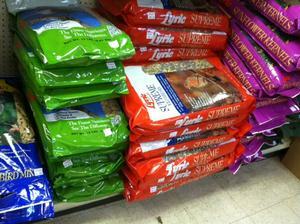 From safflower to sunflower, from thistle to peanuts, to dozens of flavors of suet, Betty’s offers every major type of bird seed at the lowest price in town. Betty's Azalea Ranch carries all the varieties of bird food recommended for the local bird population. Looking for a specific bird feeder, or the feeder that’s best at keeping out the squirrels? Betty’s has that. All available at warehouse prices every day.